Guests staying at 24 North Hotel don’t have to worry about transit to Old Town because of our daily, hourly shuttle service to Mallory Square. The ease of not having to designate a driver or find parking makes all the difference, and you can focus more on exploring the island. Interested in finding other modes of transportation to get around and see more of Key West? We have you covered. 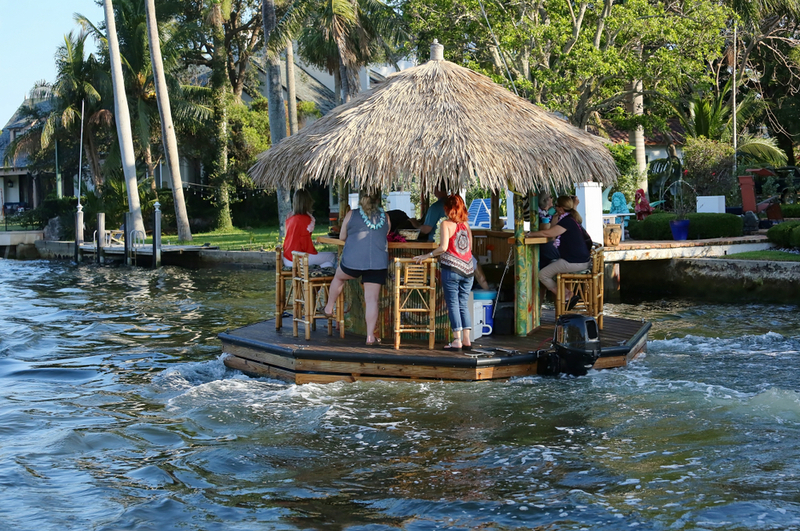 Pull up a bar stool and have a tropical drink on this floating tiki bar that travels the waters of Key West. The boat moves up to speeds of 4-6 mph and is a full tiki bar complete with bar stools, a bartender, and speakers to enjoy whatever music you’d like. The floating tiki bar offers bar hop tours, sunset cruises, trips to the sandbar, ecotours, and more. Tours run 90-150 minutes and guests are welcome to bring food and enjoy a one-of-a-kind experience trolling the waters of Key West. Cruises depart from N. Roosevelt Blvd, near 24 North. Check out more info and book ahead on the Cruisin’ Tikis website. Rent a side-by-side scooter to cruise around Old Town with the wind in your hair. These two-seat minicars are perfect to give your feet a rest and make your way around town, especially up and down Duval Street. Traditional scooters, bicycles, and golf carts are also available for rental - ask Scooter Rental staff for recommendations and routes. The best part -- parking is free for these modes of transport in Key West! More info here. Even for the most seasoned of travelers, the Conch Tour Train is a smart way to get a grasp of Key West, from its bars to its history. There’s certainly a reason it maintains a popular status in Key West. We suggest you take the Conch Tour Train ride early in your trip so you can make note of areas you want to explore further. The tour makes a loop around Old Town complete with three stops, of which you can disembark, explore, and catch another train, or stay on for the entire ride. The informative tour can save you a lot of time and research on the remainder of your trip, as you’ll learn where to get the best Key Lime Pie and which museums to visit. Get a glimpse of the Hemingway House, Key West Lighthouse, Butterfly Conservatory and more. Rides depart from the Front Street Depot and end in Mallory Square. More details here. Looking for your own treasure? Treat yourself to a trip to Key West. See the best rates for 24 North Hotel.